Vudu —Walmart's online video rental and purchase service —is coming to an app for the fourth-generation Apple TV, according to an engineer with the company. The app is "in development," the engineer said on the official Vudu forums, while warning that an actual launch date is still in the air. The service's iOS app already offers AirPlay support —which can push video to an Apple TV —but a native interface would let users browse content via the Siri Remote, and possibly keep up on shows via Apple's "TV" app. Vudu has so far made the Apple TV a low priority because Apple policies deter third parties from selling movies and shows directly through iOS and tvOS. 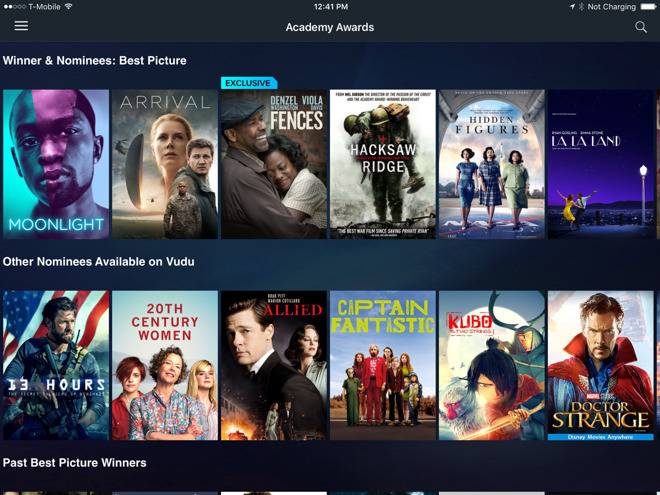 To watch Vudu content in the iOS app, people have to pay for it via the Web or an Android device, which will then add videos to a personal library. Otherwise, the iOS app only supports browsing the Vudu catalog. Walmart frequently promotes Vudu in its stores. The service is nominally a competitor to Apple's iTunes Store, but differentiates itself with things like 4K support, some free ad-supported movies, and the ability to add digital versions of disc purchases to an online locker. Vudu is also on a wider number of platforms, including Roku, Xbox, PlayStation, Chromecast and some Blu-ray players and smart TVs. The fourth-gen Apple TV was first released in Oct. 2015. Apple has concentrated mostly on tvOS updates since then, but is expected to put out a fifth-generation model later this year, adding 4K support. It's uncertain if Apple will start offering 4K iTunes video to match —all current iTunes material tops out at 1080p.